King Kennedy was born James Darius King Kennedy Jr. in Kokomo, Indiana on December 1, 1903. His father, who also went by King Kennedy, owned the King Kennedy Clothing Company in Kokomo, a highly successfull clothing store. His mother was Georgia Kennedy, a society lady of the community that he would be very close to her entire life. Mother and son lived together at the family home at 803 S. Main Street in Kokomo until they moved, together, to 702 N. Rodeo Drive, Beverly Hills, California in about 1924. They continued to live there together until 1939 when he married Harriet Parsons, a lesbian and daughter of columnist Louella Parsons, from 1939 to 1946. When Kind passed away on November 1, 1974, his ashes were given to Harriet. King first caught my attention when I found him listed on a ship manifest in 1925 along with Gilmor Brown, founder of the Pasadena Playhouse, and two other men - Maurice Wells and William Reis. I knew only that Gilmor was homosexual, I found it interesting that he might be traveling with these other three men. I looked further and found that historian William J. Mann, in his book "Behind the Screen", also believed that King was gay. Press notices of the performance from the Los Angeles Times, have been received by Mrs. Fred Way of Windsor Court Apartments from Mrs. Beatrice Wolf of this city, who is spending the winter in Pasadena, Calif. They speak of the effective manner in which Mr. Kennedy and Miss Dawn played their difficult roles. The story of the play is one of war times in London when the Zeppelins were raiding. Kennedy as a gawky Canadian corporal on leave, stumbling across Waterloo bridge at midnight as a raid is on, meets Myra, a girl to whom gentleness was almost unknown, played by Miss Dawn. Kennedy is reported to have been attracting attention at the Pasadena Community Playhouse and Mr. Morgan, the producer, hails him as a "find." He also has had some experience in the east. He is the son of the late King Kennedy, long a leading business man of Kokomo. Miss Dawn after playing a variety of roles in eastern companies and doing considerable radio work went to the west coast some months ago. 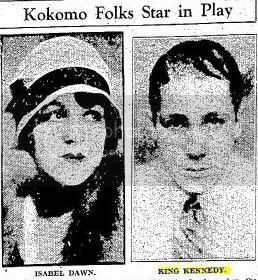 That these Kokomo young people should be cast to play opposite one another in the theatrical center of the west is a coincidence of more than usual interest to their friends and acquaintances here. King Kennedy of Beverly Hills, Calif., is visiting for a few days in this city with Mr. and Mrs. U. G. Collins and other friends. Mr. Kennedy is en route to New York City. King Kennedy and Bruce Riley of Beverly Hills, Calif., arrived in Kokomo, Sunday, from New York City to be the guests of Mrs. G. W. Fredrick and daughter, Pauline, for a few days. Frank W. Bryant, receiver of the Citizens National bank, Saturday submitted his resignation in circuit court as trustee for Georgia K. Kennedy and King Kennedy, and the court approved his action and directed that securities in the value of $80,000 be turned over to the Kennedys. The trustees report showed receipts of $316,241.78 and disbursements in the same amount. KING KENNEDY, actor and playwriter, now of Beverly Hills, California. Mr. Kennedy's career began at the Pasadena Community Playhouse soon after he moved away from Kokomo about ten years ago. Since then he has played professionally in support of MAry Boland, Frances Starr, Mrs. Leslie Carter, Mrs. George Fawcett, Carolotta King, Helen McKellar and with Nancy O'Neill in "Lysistrata" and "The Passion Flower." Recently he has published several plays, among them "The Garden" and "The Girl". King Kennedy, of Beverly Hills, Calif., has lost a dog in Kokomo and will welcome any information as to its location. The dog, a white Spitz named "Ricky", disappeared from the home of Miss Pauline Fredrick, where Kennedy is visiting, Friday evening at 6 o'clock. The animal was wearing a red collar and is said to be a valuable dog. Kennedy was taking the dog to California from New York. The Tribune has received a clipping from the Los Angeles Examiner which tells of the engagement of King Kennedy, formerly of Kokomo and widely known here, and Miss Harriet Martin of Los Angeles. Mr. Kennedy's father, the late King Kennedy, was engaged in men's retail clothing business here for many years. The son makes his home with his mother, Mrs. Georgia Kennedy, of Beverly Hills. The following is the announcement which appeared in the Los Angeles newspaper: "Dr. and Mrs. Harry Watson Martin (Louella Parsons) have formerly announced the betrothal of their daughter, Harriet, to King Kennedy, only son of Mrs. Georgia Kennedy of 702 Rodeo drive, Beverly Hills. The news was revealed at a family dinner at the Martin's San Fernando Valley ranch, "Marson Farm,' given in celebration of the birthday anniversary of the bride-elect's mother. Long identified in Hollywood as a writer of film news like her celebrated mother, the bride-to-be has more recently made a name for herself as a producer of 'Screen Snapshots,' made at Columbia Studios. She also writes for the Los Angeles Examiner and other Hearst newspapers. Her education was received at Horace Mann School in New York and Wellesley College, having been graduated from both institutions. "Mr. Kennedy is a member of a prominent Southern family and received his education in private schools at Asheville, N.C. His grandfather Keating was the first mayor of Louisville, Ky. In recent years he has been interested in the Little Theater movement and appeared on the legitimate stage with Constance Collier in "The Torch Bearer'. He is a playwright and his "Buckshot and Butterflies' was a successful production. The young couple have as yet no plans for their wedding, but it will probably take place sometime in the fall." With the hospitable country estate, Marsons Farm, of Dr. and Mrs. Harry W. Martin in San Fernando Valley as the settling for the nuptials. Miss Harriet Parsons, daughter of Mrs. Martin (Louella O. Parsons) and the late Capt. John Dement Parsons, became the bride of King Kennedy 2nd, son of Mrs. Georgia Kennedy of Beverly Hills and the late King Kennedy, this afternoon. Witnessing the ceremony, at which the Rt. Rev. Robert D. Goodman, D. D., of St. Paul's Episcopal Cathedral, officiated, were only members of the two families and a few intimate family friends. This was followed by a reception to which 200 friends of the young couple have been bidden. It was in the form of a buffet supper, with dancing, the supper tables set around a small dance floor. Later Mr. Kennedy and his bride left on a honeymoon trip to the northern part of the state. When they return, some time next week they will take up their residence temporarily in Westwood while their new home, now under construction in the San Fernando Valley, is being completed. The gardens of Marsons Farm were the setting for the late afternoon nuptials, an improvised alter of all-white blooms, gardenias, dahlias, chrysanthemums, etc, being arranged at one end of the garden. Leading to the floral alter was a satin carpeted bridal aisle flanked by small gardenia trees, and down this Miss Parsons walked to her wedding on the arm of Dr. Martin, who gave her in marriage. Carrying out the same decorative motif, all-white blooms were used to decorate the house and the rest of the gardens where the reception was held. The tables in the garden featured centerpieces of wedding bells, and the bride's table was decorated with a large suspended wedding bell, white tapers and lilies of the valley and bouvardia. A graduate of the Horace Mann School in New York City and later of Wellesley College, the bride is at present a writer of film news and a producer of short subject, "Screen Snapshots," at Columbia Studios. Mr. Kennedy, too, is identified with the theater, his chief interest being in the Little Theater movement, both as a playwright and an actor. 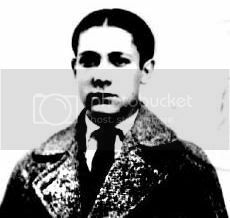 A member of an old southern family, he received his education in private schools in Asheville, N.C. Both Mr. Kennedy and his bride will continue, actively, their careers. Serving as the bride's only attendant was Mrs. Ross Shattuck (Margaret Ettinger), while Llewellyn Bernard Nelson was the best man, and Edward Graham, Robert Tobey, Fred Dore and David Warner the ushers. For her wedding, Miss Parsons wore a gown designed on classic lines, created especially to complement a string of pearls worn by every bride in the family for the past four generations. The gown, of white silk jersey, featured a long draped skirt, long sleeves and delicate seed earl embroidery on the bodice. Her short tulle veil was attached to a headdreses of white silk jersey. The bride's attendant, Mrs. Shattuck, wore a royal blue crepe gown with padded shoulders, long tight sleeves fastened with gold hooks and eyes, and long skirt flaring at the hemline. With this she wore a small hat of ice blue feathers with shoulder veil of royal blue maline, ruby earings and clips, and carried a shower bouquet of American beauty roses. Receiving her guests, the bride's mother, Mrs. Martin, wore an afternoon gown of dubonnet crepe and lame, the lame varying in shades of deepest dubonnet to shell pink. Her picture hat was a dubbonet velvet trimmed with ostrich tips. While assisting Mrs. Martin, the bridegroom's mother, Mrs. Kennedy, was in afternoon gown of Vienna blue velvet with full skirt and draped bodice and Vienna blue velvet hat with ostrich plumes in lighter blue-green shades. King Kennedy Jr. started at the Pasadena Playhouse about 25 years ago and took the leading role in "Waterloo Bridge" The leading lady was a Kokomo girl, Isabel Dawn. Kennedy then played in "The Shanghai Gesture," with Mrs. Leslie Carter; "The Shelf," with Frances Starr; "Lysistrata" with Nance O'Neill, and "Meet the Wife," with Mary Boland. He made two pictures - "Seven Days Leave" with Victor Mature, and "Higher and Higher," with Frank Sinatra. He turned to writing, married Louella Parsons' daughter, from whom he was divorced, and then worked for Hedda Hopper. Now he has a publicity and public relations firm in Beverly Hills. Kennedy Georgia K. Head 63 W widow Missouri Illinois Kentucky None . Address: 803 South Main St., Kokomo, Ind. Address: 702 Rodeo Drive, Beverly Hills, Cal. "Following passengers destined "NEW YORK"
Intend to travel: to Portugal, Algiers, Slavia, Constantinople, Gibraltar, Spain, Palestine, France, Syrian, Egypt, Greece. Before me, the undersigned, a Notary Public in and for the County of Howard, State of Indiana, this the 20th day of December A.D. 1921, personally appeared Mrs. Georgia K. Kennedy, who being by me duly sworn upon her oath, says; that she resides at 803 South Main Street Kokomo, Indiana, and that she is the mother of James D. K. Kennedy, Jr. who resides at 803 South Main Street, in the City of Kokomo, Indiana, and who has an application on file in the Department of State, Washington D.C., in the Division of Passport Control for consent to go abroad, to whom the Department of State, through Phillip Adams, Chief of Examiner, Division of Passport Control, addressed a letter, December 15th, 1921, and said in reply, Refer to PC 12-21-2631; that the said James D. K. Kennedy, JR., was born in the City of Kokomo, Indiana, December 1st 1903 and expects to go abroad February 14th 1922, and this affiant, Mrs. Georgia K. Kennedy, hereby gives her full consent for her said son, the said James D. K. Kennedy, Jr., to go abroad as requested in his application.